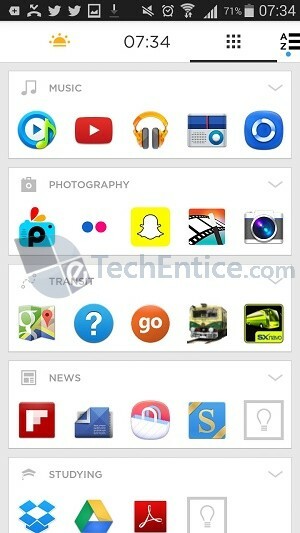 Yahoo made this Aviate Launcher to give you a feeling of freshness and something different from your boring home screen. The UI and the wide range of features are just fabulous. When you install it in your Android device you will get an email that will specify its best features. Aviate gives the best accessibility to any app you prefer by allowing you to decorate your home screen with your own personal touch. You get easy access to calls, mails, weather updates, traffic updates and all that you want in your grip. Aviate intelligently shows you apps and information based on where you are and what you’re doing. These are your “Spaces” and they change automatically throughout your day. To check ‘em out, just swipe all the way left. Apps on your homescreen are your “Favorites”. Aviate also automatically sorts your apps into “Collections.” To edit, just hold and drag any of your apps. 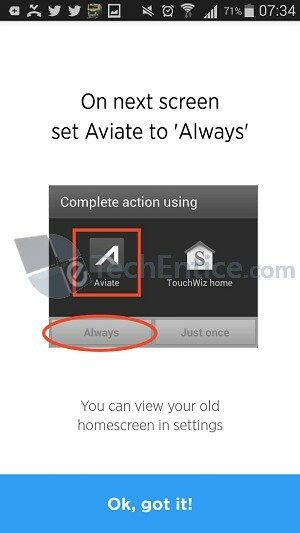 You can launch Yahoo Aviate Launcher from Play Store and when installation is finished, open it. 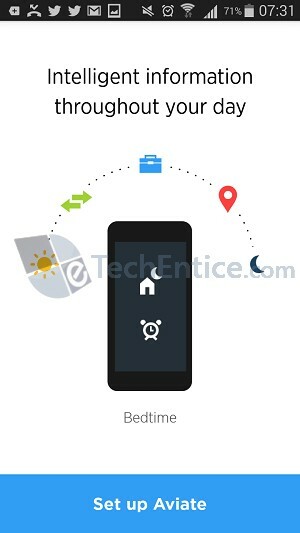 As you open the application it will display the simple layout of your smartphone and prompt you to Start. Tap on Start. Then keep on sliding and you get a brief of what it is all about, how the apps are organized and so on. When prompted tap on “Set up Aviate”. Next you will be redirected to the set up procedure. Select at least 10 apps you frequently use. You can select more and click Next. Next comes a very interesting classification panel where you will be asked to choose the types of apps you want to see. This choice is huge from Music to Studies to restaurant to travel it includes everything. Make proper selection and do not hesitate to select all. Even if you do not have an app corresponding to a particular class you will be given suggestion and you can download the apps later on. In the final phase select Always to set Aviate by default. However the old home screen can be viewed in Settings. By tapping “Ok, got it” you get to experience the Launcher. Now you are done! The Launcher will look amazing believe me. There are different sets of organizations of apps for different screens. 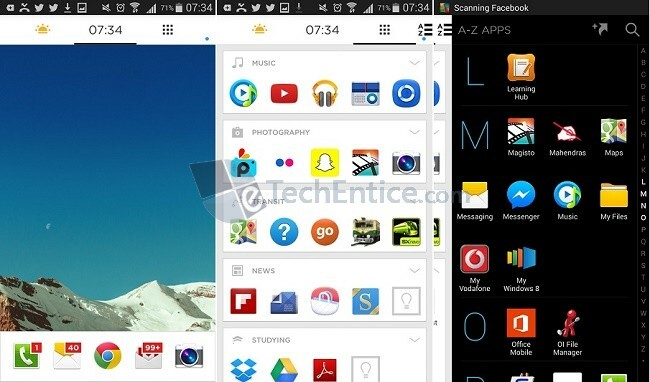 The first one contains the most used apps which can be edited by adding or removing an app. In this screen you will be allowed to add photo of your choice, add widget or collections. The next screen consists of the classified apps. You can download edit or remove any app. The third screen lists all apps in alphabetical order. There is a search option available at the top. In short you can have full flexibility in personalizing your screen. 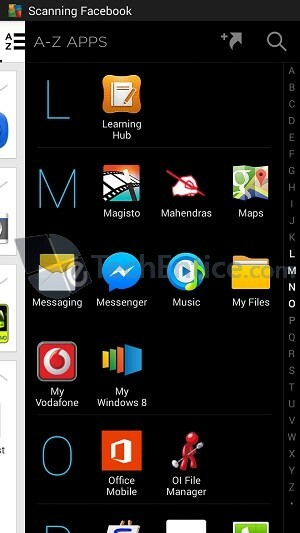 Yahoo Aviate Launcher is not compatible with Android 2.3 i.e Gingerbread. They are working to bring it for Gingerbread too but will take little time. Android +4.0 is best for listening Space Experience. Android 4.2 faces some technical issues and Galaxy users must upgrade to 4.3 or above if available. So don’t wait and install Yahoo Aviate Launcher. A daily routine manager, sleep tracker, weather alert, quick and fast call messaging service all in one app makes Aviate no less than a maverick. To enjoy every bit of it you have to use it.